Machine operator jobs are mostly available in the construction and manufacturing sectors. Besides having normal driving skills, workers in this area usually have to acquire advanced training in operating one or more equipment that use complicated systems. In many countries, one is not allowed to run certain machines unless they have the appropriate training, certification and license that show their capability. 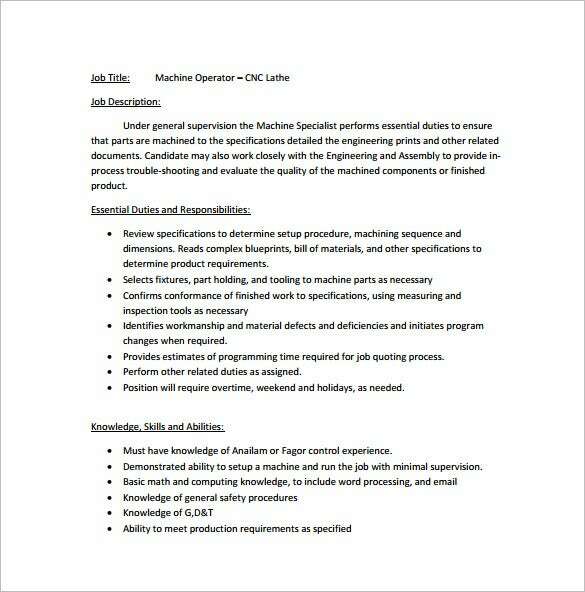 You may like Chief Operating Officer Job Description Templates. As long as you have the right skills and documents, securing a job is relatively uncomplicated because many companies adopting machinery today lack adequate people to run them. With further part- time studies you can easily move up the professional ladder. You may also like Job Description Templates. 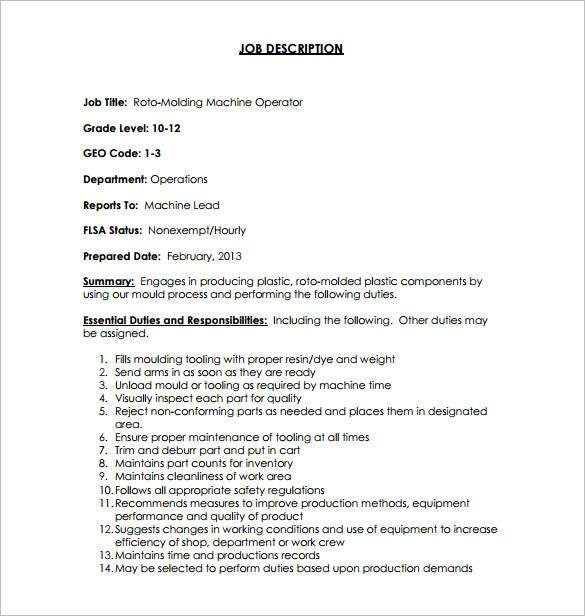 gvlpoly.com This gives a crystal clear detailed account of job description of a plastic machine operator. The document considers everything such as qualification, competence, technical skill and the duties & responsibilities of a machine operator producing plastic components using roto-molding process. It further describes his commitment to quality, quantity and safety and is very useful. 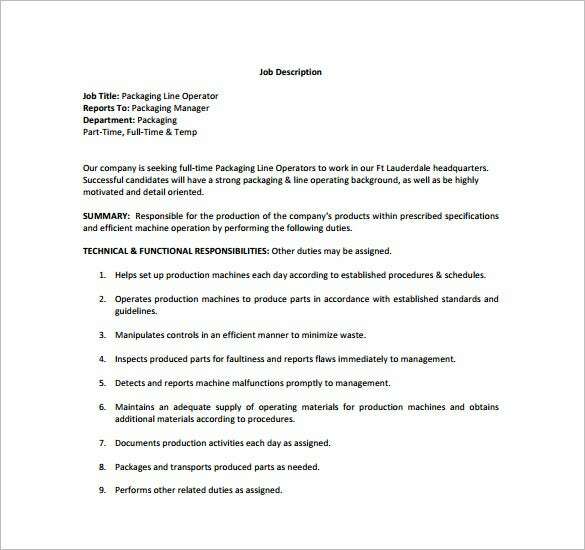 themedo.ca In case you are looking for the job of a packaging line operator, this template can provide you detailed information about the technical and functional responsibilities like setting the machine, ensuring effective control for minimizing waste, everyday documentation. Going through the template you can also learn about the details of skills and aptitudes required. gvlpoly.com The machine operator for Press is required to control tandem machines for meeting the daily production requirements. 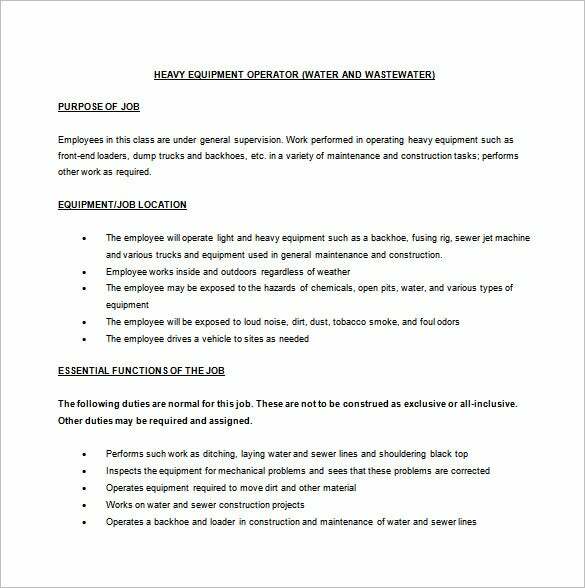 Scrolling down the template you will be able to know about the principal functions, essential qualification, working conditions and the skills required for this job. In case you are aspiring for this job, this template can guide you well. hartnell.edu This template depicts the basic requirement of a CNC Lathe Machine Operator and provides very good guidance about your education & experience, knowledge & abilities and the duties & responsibilities in every detail. It also indicates who can apply for the job of a lathe machine operator; very useful for the job seekers. 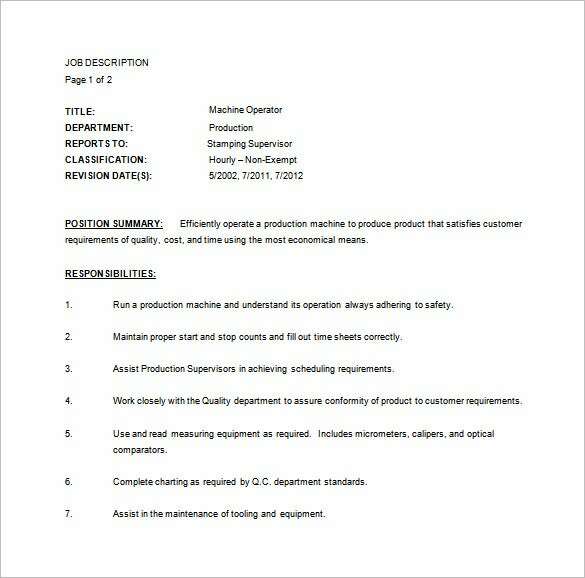 > What are the uses and purpose of the Machine Operator Job Description Templates? Machine operating involves high risk and people who do not have the requisite competence are not allowed to run machines. Those who are working in a factory environment are expected to do multiple functions for meeting meet the production commitment. They also have to deliver quality products and follow the safety guidelines. Samples with free download options are of great use. These provide all the responsibilities, skills, training and other requirements ready at hand saving considerable amount of time. These samples also guide the operators to understand what is wanted very clearly and also help the job seekers to format resumes accordingly. 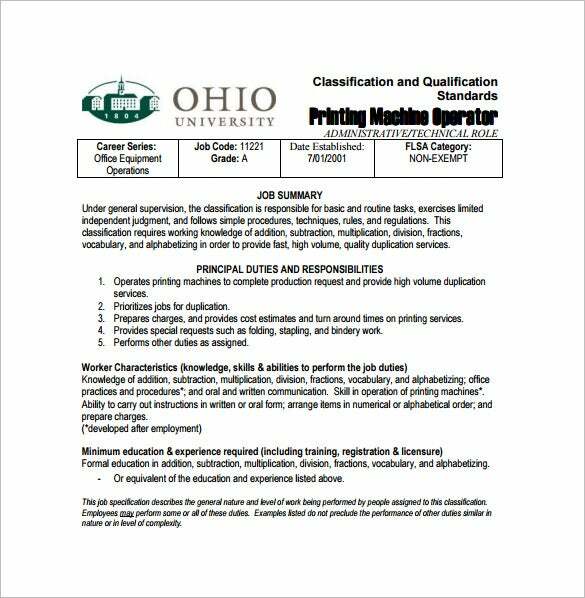 > Who may use the Machine Operator Job Description Templates? 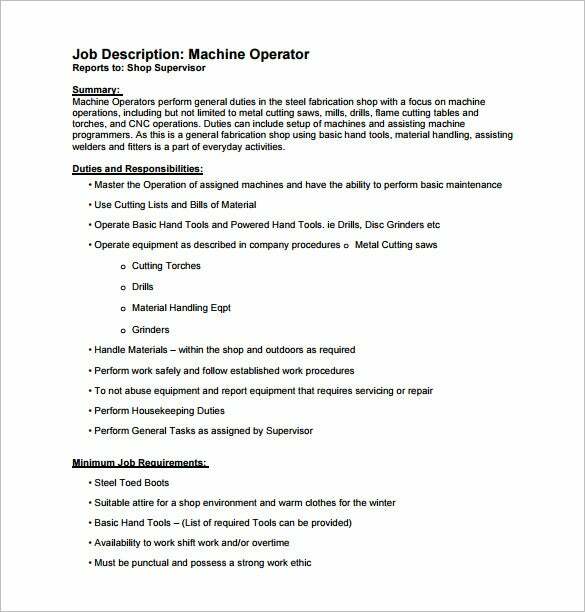 The machine operator job description templates specifically highlight the duties and responsibilities of machine operators. For the people who happen to be the person-in-Charges for smooth operation in factories, these allow them to create clear documents for communicating what are the expectations and commitments to be met by the operators. Such templates also benefit to restore normalcy if there in case of deviation. Moreover, understanding the content of the templates also help the machine operators to be fully aware of their multiple functions. 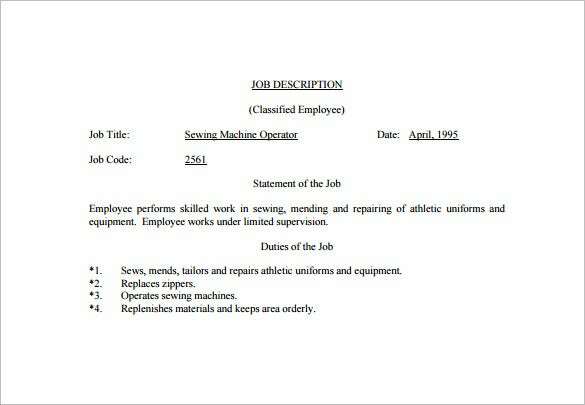 Even, the job seekers for the position of machine operators can also use these templates for structuring their resumes. 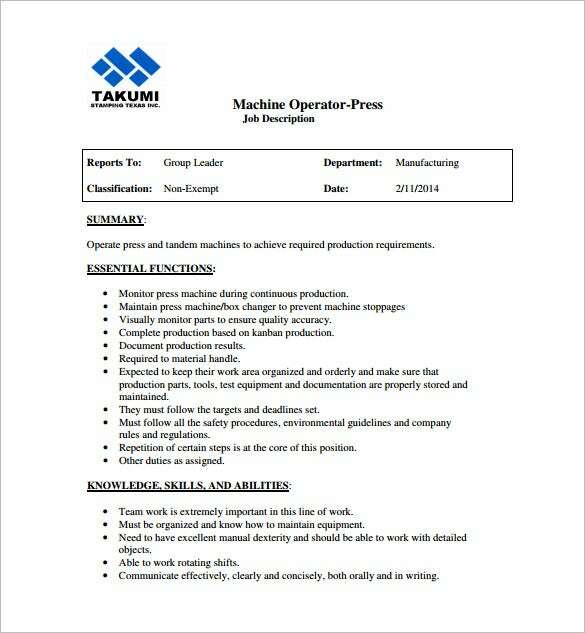 > Who are Benefited from Machine Operator Job Description Templates? 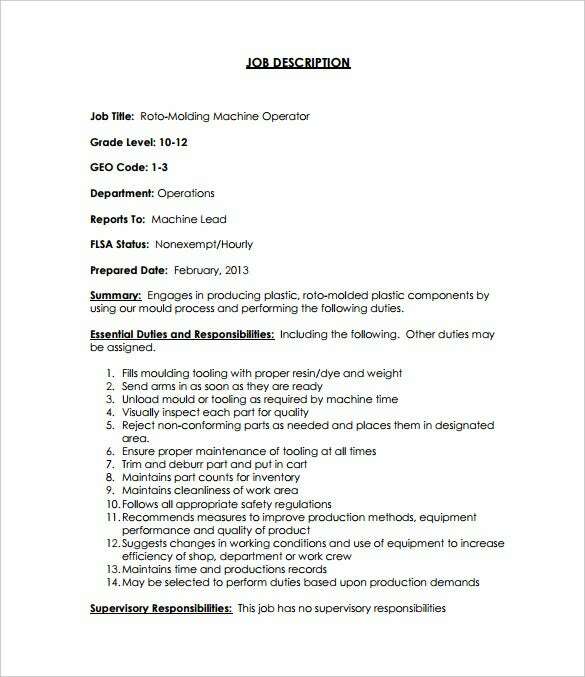 Samples of the machine operator job description templates offer multiple benefits. These templates can be used as standard reference documents for smooth operating of various high risk machines. Other than this, well-developed job description templates also reward the organization in many ways. Use of such templates avoids the onerous task of writing job descriptions every time and also save the cost of appointing writers for the same. These further helps to frame better recruitment, assist in structuring better compensation data, help in planning of people for filling voids, arranging training, development program & performance evaluation and last of all meet the legal requirements. 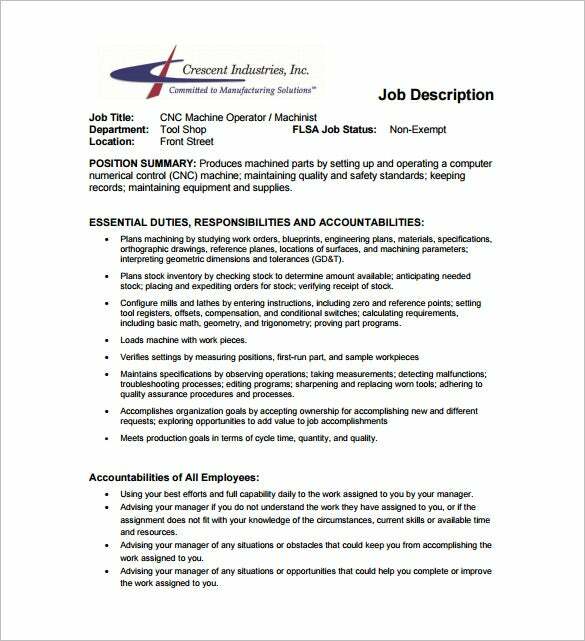 Conclusion Machine operator job description templates let everyone know the rolls, responsibilities and skills required for the job ready at hand. These templates also save you from the trouble of drafting it when you require; and thus you can save time and resources. Moreover, these let you have error free documentation for all purposes.